The Dell 3400MP Pro is so tiny that when you pack it away in its smart carry case, it measures almost exactly the same size some of the bigger projectors on the market today. It comes as no surprise that the Dell is rather noisy, but the case is so small that the mechanism is only a few millimetres away from the outside world. 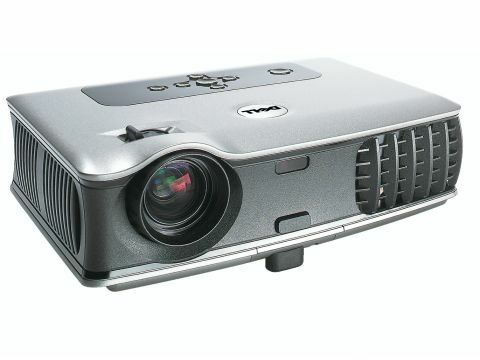 You pay plenty for the privilege of this technology, as the projector costs £985 (inc. VAT and delivery), and when it's time for a new bulb after 3000 hours of regular use, it will cost you £235 (inc. VAT). But, in return, you get a projector that appears to be far brighter than it's 1500 lumens rating, no doubt thanks to the enormous 2100:1 contrast ratio. Displayed whites look very bright and clear and colours are also good, and while we're not convinced that black is absolutely black, it's certainly good. This is inherent in the DLP technology, but the strange thing is, the display looks rather harsh and unpleasant. Out of the box the brightness is set at 50 per cent, which positively glares at you, but if you decrease the setting you'll find that colours become muddy and dull. Dell has chosen exactly the right connectors for business use, with audio in and out jacks, DVI input, S-Video and Composite, and a full selection of cables, including a VGA to DVI converter. The set-up buttons on the projector have symbols, but aren't clearly labelled and, while it doesn't take long to figure things out, we would have appreciated some help.